On a day when the Port Authority voted to spend billions of dollars on an assortment of projects, it also made a big decision about the bus terminal that will replace the decrepit one we have now: The new building will be located in midtown Manhattan, not in New Jersey. Scott Rechler, Andrew Cuomo’s top appointee to the Port Authority, had asked the agency to explore putting the new terminal near the Secaucus Junction train station in New Jersey. But New Jersey politicians were against the plan, as were many commuters who would have to transfer to the train to come into Manhattan, and Jersey prevailed. Rechler had been pushing for the terminal to be built in New Jersey for more than a year. Doing so, he said, would both cost less and reduce traffic congestion in Manhattan. He also envisioned it one day connecting with either an expanded PATH system or a new tunnel under the Hudson River that would double train capacity into midtown. Rechler had even insisted that the Port Authority conduct a study of trans-Hudson transportation trends for the next 30 years as a condition for allowing the bus terminal’s design competition, announced earlier this month, to move forward. As explained by the Record, his hope was that the study will show the need for an alternative to increased bus traffic through the Lincoln Tunnel. As part of a deal announced Thursday, Rechler will drop his push for a Jersey-based terminal, and in exchange, New Jersey’s top appointee to the authority withdrew his opposition to a $4 billion reconstruction plan for La Guardia Airport’s central terminal. New Jersey Senate president Stephen Sweeney called the deal “an enormous victory for commuters” at Thursday’s Port Authority board meeting. 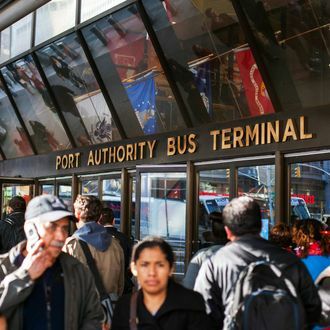 In all, the Port Authority Thursday voted to spend tens billions of dollars — not just on the bus terminal (which could cost $10 billion) and the overhaul of La Guardia but also on enhancements to Newark Liberty Airport. The board also approved spending $70 million on the proposed Gateway Tunnel rail project, the cost of which would be divided between the authority and the federal government.